Movie Starlet Eva Mendes turned up at Macy's in the OC over the weekend to launch her new collection of hand painted dishes and tabletop items called Vida for Espana. Eva looked like she was ready to banish the rain from Southern California forever in her Christian Lacroix floral cocktail dress. Here's a few pictures of Vida from Macy's. I like the cheerful, Mexican inspired colors and tiny patterns. Vida is inspired by Eva’s childhood memories of spending time at the table with family and friends. MM... I wonder what was for dinner :) Check out Vida exclusively at Macy's. All of the Vida products are currently on sale at Macys.com Here's the deal: you'll receive 15% off when you purchase over $125.00 worth. Use the code: HOMEFREE for extra savings. Macy's also offers a Vida by Eva Mendes home collection, which features comforters, sheets, decorative pillows and window treatments. 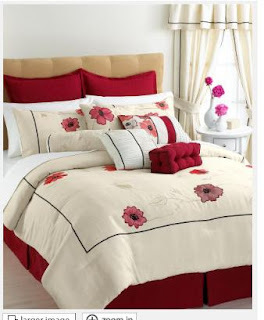 Check out one of the bedding sets. This one is called Penelope. I am a sucker for red poppies. Eva mendes is so beatifull , We love her.